Looking to increase the value of your home? Or are you tired of your lawn being boring? Are you looking for a new project that doesn't have to be expensive or tiresome? Maybe it's time to work on your front yard a little bit! What do we mean when we say "curb appeal"? What comes to your mind? It doesn't mean adding new cement curbing around your trees, flower beds, or lawn (although, that can be one way to increase your "curb appeal"). Curb appeal is generally the feeling or reaction someone gets when they look at your front yard from the curb or sidewalk. 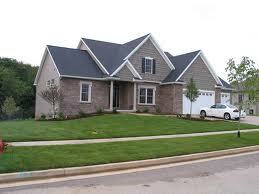 You want to have a nice curb appeal so that people are not afraid to approach your home. You should want your curb appeal to be welcoming, inviting, and impressive. Let's look at some ways of doing that. The first thing you're going to want to do that will bring immediate, positive changes to your front yard is to make sure your lawn and all your plants are getting plenty of water. Get your Orbit Sprinkler System in place before anything else! Before you get started, identify the focal point, or center of your yard. For most people, this can be a fountain, or an exotic tree or bush. The more experienced yard decorators use the front door as the main focal point of the front yard. 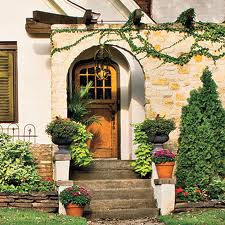 A nice looking front door can say a lot about a person and can make a huge difference to a front yard. If you have a bit of space near the entry of your lawn, consider installing a small garden of lovely flowers and other small plants. Something real basic is perfect for the edge of the driveway where your lawn begins. Prune and shape existing shrubs and foundation plants. This can help revitalize your yard and make it look new. Use vertical plants to soften your house's corners. Ornamental grass gives a fresh look to your home and your yard. 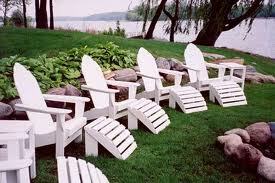 Patio furniture is a great way to utilize space. Whether it be patio space or a corner of your yard, use chairs, tables, swings, and/or hammocks to bring your lawn to life. Go to yard sales, thrift stores, and Look Online. Secondhand stuff is great because you can fix them up anyway you want and often times they end up looking rustic and urban which is great for outdoor decor. Use solar lighting and place lamps along your walkway. This will bring your yard and house to life at night and give an attractive ambiance. The solar energy is very handy because you don't need to constantly be replacing batteries and so forth. Fixing up your yard can be a lot of fun and well worth the work if you put in enough time and effort. Look around at some landscape magazines and watch home improvement TV shows for new ideas.